Patel has been sulking ​since the announcement of portfolios in the new BJP government in the state, as he was given less significant responsibilities. AHMEDABAD: Gujarat Deputy Chief Minister Nitin Patel, who has been sulking since the announcement of portfolios in the new BJP government in the state, today said the issue was about his "self-respect". Patidar leaders Hardik Patel and Lalji Patel have declared support for Patel. Lalji Patel has also announced a bandh in Mehsana on January 1 and demanded that Patel be made the chief minister. Patel, who is yet to take charge of the portfolios allotted to him, said he expected a proper response from the BJP high-command to his "feelings". "I have conveyed my feelings to the party high-command and I am hopeful that they will give a proper reply to my feelings soon," he told reporters. "This is not about some departments, this is about self-respect," he added. 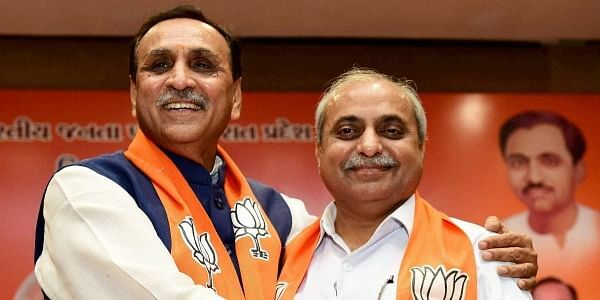 The portfolios in the new BJP government, headed by Vijay Rupani, were allotted two days ago. Patel, who handled important departments such as finance and urban development in the previous government, was allotted road and building, health, medical education, Narmada, Kalpsar and capital projects this time. The deputy chief minister, who belongs to the influential Patidar community, has not taken charge of these departments so far, while his supporters today thronged his residence here to express solidarity with him. The finance portfolio has been alloted to Saurabh Patel, while chief minister Rupani has kept the urban development department with himself. Narottam Patel, who was a minister in the Narendra Modi-led Gujarat government, said Patel should be given portfolios "as per his stature". "Nitin bhai is not an ordinary minister," he added. Earlier in the day, Rupani skirted reporters' questions on the issue. While announcing the portfolios, Rupani had said, "It is not true that the minister, who has the finance portfolio, is the number two in the cabinet. Nitin Patel is our senior leader and will remain the number two." Patidar quota agitation spearhead Hardik Patel said he would extend support to Patel. Talking to reporters, he said, "As a veteran politician, Nitin bhai has worked hard for 27 years to ensure that the BJP stays in power. The (Patel) community members need to understand that such politicians are being sidelined (in the BJP)." If Patel decided to quit the BJP and said 10 other MLAs were ready to quit with him, "We will talk to the Congress to take in Nitin bhai and give him a post he deserves," the Patidar leader said. Senior Congress MLA Virji Thummar said Patel would be made the chief minister with the Congress' support if he quit the BJP. The opposition party, however, clarified that Thummar was speaking in his personal capacity and described the row over portfolio distribution as the BJP's "internal matter". "It is the BJP's policy to disregard its senior leaders and sideline them once it finds them to be of no use. This has especially been the case with Patidar leaders like Keshubhai Patel, Anandiben Patel, Gordhan Zadaphia among others," state Congress spokesperson Manish Doshi said. Lalji Patel, whose Sardar Patel Group was at the forefront of the Patidar quota agitation, along with the Hardik Patel-led Patidar Anamat Andolan Samiti, met Nitin Patel in Gandhinagar. He called for a bandh in Mehsana -- Nitin Patel's Assembly constituency and a place which was the epicentre of the Patel quota agitation -- on January 1. With 99 MLAs, the BJP has a simple majority in the 182member Gujarat Assembly, against the 77 MLAs of the Congress.